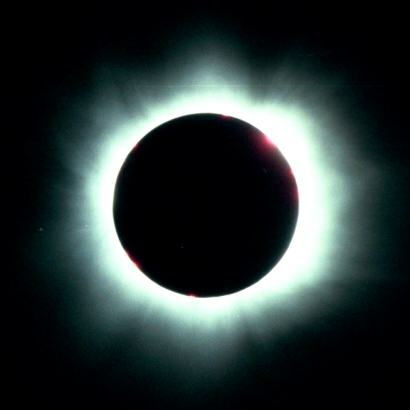 One of a series of photographs of the total solar eclipse of August 11 1999 taken from the grounds of the Hotel Marina in Balatonfüred, Hungary (46° 56´.848 N, 17° 52´.869 E). The photographs were taken using a Minolta X-700 camera body and a Questar 700 mm, f/8 mirror lens on Kodak Select Series Royal Gold 100 Film. A Questar solar filter was used when photographing the partial phases. No filter was used during totality. This digital image was scanned from the negatives.